So...not an auspicious title screen. 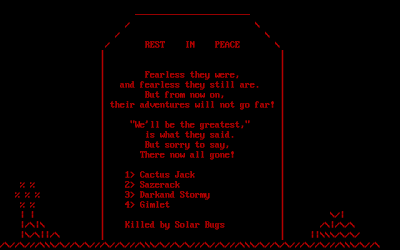 The major difference is that the little smiley face represents a party of up to four, and when you encounter a foe (represented by little letters, just like Rogue and NetHack), the game suddenly goes all Wizardry in its combat options. How a giant spider screams anything is left up to the imagination. Evets was designed by someone named Steve Ackerman of La Habra, California, who briefly ran his own company called SAck Enterprizes. (We may thank providence he didn't have a partner named Nathan Utley.) It's a shareware game, and an opening screen solicits $10 from anyone who enjoys the game. The jury's still out on that. I had practically this entire posting written about how I can't figure out how to do anything in the game because I couldn't find a manual. I went so far as to track down one of Steve's relatives and ask him to send a message asking Steve to contact me, and then I found that the manual is in a file called Evets.MAN. Who the heck uses the MAN extension for a manual? When I saw Evets coming up on my list, before I knew anything about it, I somehow got the idea it was about some kind of cute furry creatures. Isn't that what "Evets" sounds like? Maybe I had Ewoks on my mind. "Evets" is, of course, "Steve" in reverse--not as bad as "Werdna" but I'm still tired of this trope. In the game, "Evets" was a powerful mage who disappeared while exploring a dungeon with a fighter named Belham. Legend has it that his ghost haunts the dungeon...or could he still be alive? Either way, the dungeon is reportedly full of treasure, so there's no lack of excuses for exploring. You create a party of up to four characters, selecting from fighter, mage, thief, and priest classes, and human, dwarf, elf, hobbit, orc, half-elf, and half-orc races. You also choose one of 10 alignments: the standard Dungeons & Dragons combinations plus an additional "amoral" alignment. At first I wasn't sure how that differs from "neutral," but then I began to realize that a neutral character tries to achieve a certain balance, while an "amoral" character is simply uninterested in concepts like good, evil, order, and chaos. I like it. Although there are only four classes at the beginning of the game, your characters can go up before a "review board" found on the first level of the dungeon, and--for lots of gold--change their classes to any of the other original classes plus three other possibilities: ninja, samurai, ranger, and monk. The manual doesn't make it clear what the advantages of these classes are, although it does mention that they get some spell points. 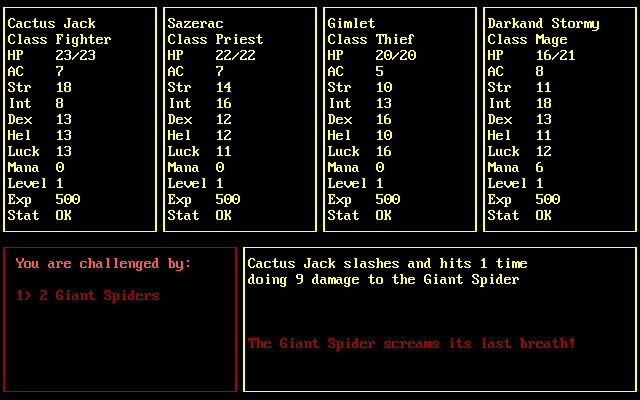 The dungeons do not appear to be random like most roguelikes. At least, the first two levels are not. There are rather limited number of commands while exploring. You can move, go up and down stairs, cast a spell, or use an item. There doesn't appear to be a "search" feature, which makes me wonder what the thief class really does, plus leads me to believe that there are no traps or secret doors. Priests and mages share the same pool of spells, but each class casts some spells easier than the other (with a lower mana cost). There are 45 spells, going up to Level 20, and your characters can cast spells corresponding to their levels. At level 1, I have Magic Missle [sic], Shield 1, and Bless 1. 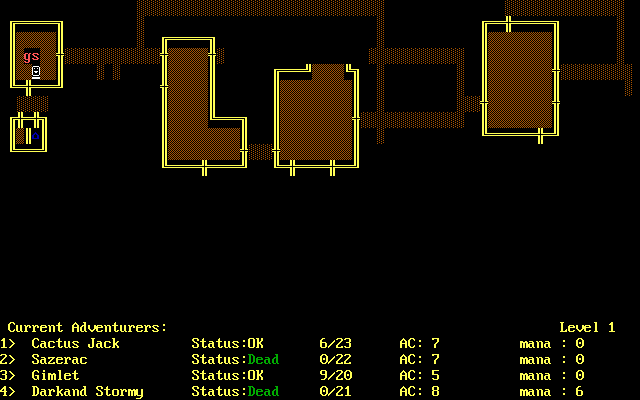 There are some interesting ones, like Find Stairs, Find Shop, Level Transport, and Monster Sensing. Casting a spell in combat. The dungeons don't seem to have any items in them. There is a shop at the entrance and others on various levels. 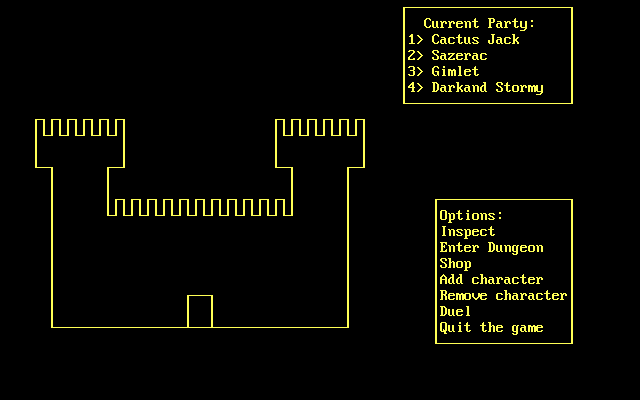 Unlike most roguelikes, the game does not delete your saved game when you reload. There doesn't seem to be any food in this game. Both spell points and mana regenerate as you move around. Combat is not quite as tactical as in Wizardry or even The Bard's Tale, but it's definitely more interesting than most roguelikes. 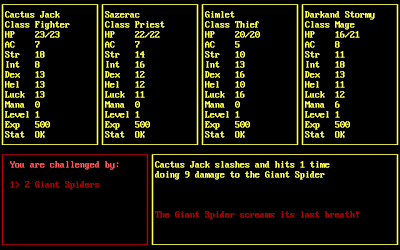 You face multiple monsters, and sometimes multiple groups of monsters, in each combat. 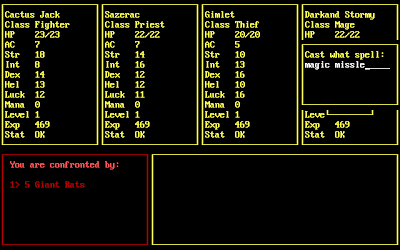 Each character has options to fight, cast a spell, use an item, parry, or flee. Some enemies have special attacks. You get the drill. On the other hand, each combat takes about three times as long as most roguelikes, and in some ways I miss the fast pace. ...but the ability to reload takes some of the sting away, if simultaneously making its roguelike creds a little suspect. 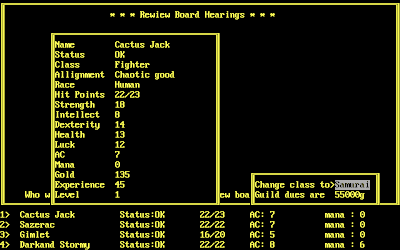 While the idea of a multi-character roguelike is appealing, I confess to some skepticism about this game. I have yet to collect a single item from the dungeon floor or from a slain foe, I've seen nothing to suggest that race and alignment play any role in the game, and I can't imagine what use a thief is. It's as if the creator had some good ideas but never finished integrating them into the game. On the other hand, maybe the first few floors are just introductory and I'll find more encounters of interest on lower levels. I'll let you know. I think I remember playing this game for a bit back in my BBS days in the early '90s. It was memorable to me mainly because I had also been playing Wizardry 6 around the same time and noticed the same similarities that you mentioned. 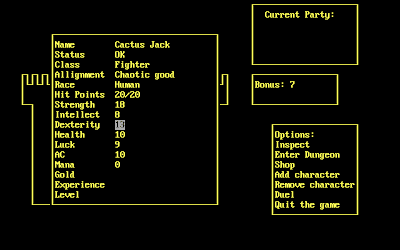 I don't remember it holding my interest for long, though, as I found roguelikes like UMoria and RPGs like Wiz6 more engaging than this hybrid. 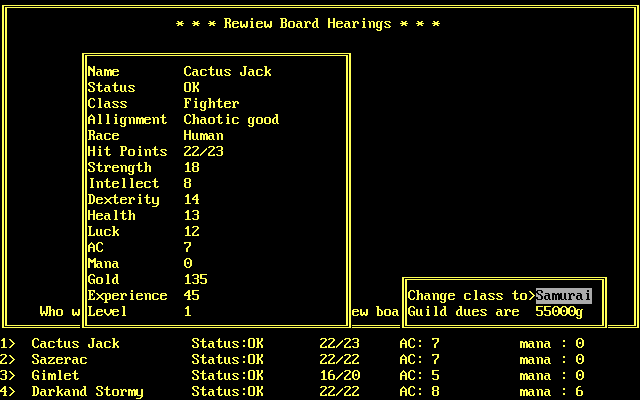 There is another multi-character roguelike called Guild. 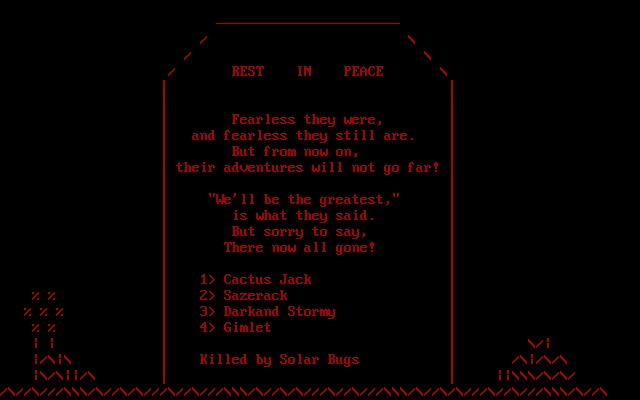 Its much more recent, and much more roguelike. All 4 members of your party appear in the dungeon, and can move around independently. You control one of them at a time (you can change whenever you want), while the others are AI-controlled. The AI was actually quite good. Unfortunately, I believe the developer has since abandoned the project, although its still available for download. 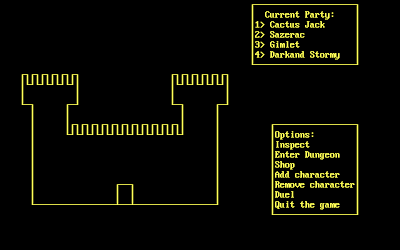 People debate endlessly about what defines a roguelike, but without random levels or permadeath, most probably wouldn't apply the appellation to this game. As Anonymous mentioned there ARE party-based roguelikes out there (check out the Roguebasin wiki). This sounds more like a JRPG-style game that happens to use ASCII symbols instead of a graphical map. Hold up there, Chief. Everyone knows Darkand Stormy is a knight. I hereby dub Sean the King of Puns! This didn't even occur to me; I was just trying to make a party based on cocktails. Heh, I just killed a guy called Evets in Dragon Age 2. Weird. Funny, anonymous, I just killed him, too. I wonder if there is any connection, ie the DA2 character was named for this game. I played this game SO HARD I fell asleep in middleschool the next day... and I think there was no end. At one point I found Evets and an accompanying bodyguard and killed them and -- nothing. The game just keeps going on and on. Eventually I got Pirates and Starflight, but this was my first ever CRPG. Yes me as well. 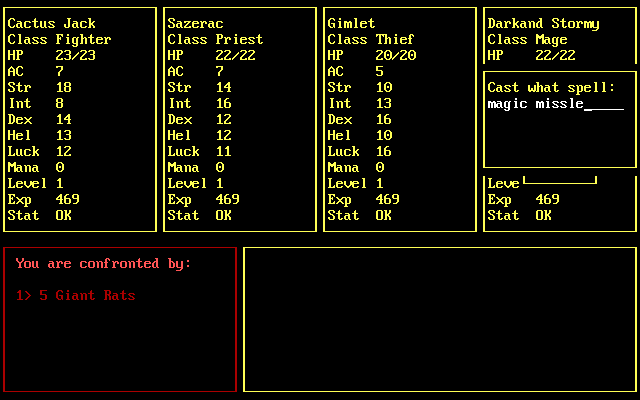 Evets and his bodyguard are very far down in the dungeon, I think around level 20 or 25. The game is both impossible to win and boring to play without magic, and so I always played the mage. There was a rich selection of monsters created for the game, many of the more difficult ones with weaknesses that needed to be figured out or learned through trial and error. Monsters become progressively more difficult, as well as unique and rare, which was one of the draws of the game. I believe the author started using a random maze generator either towards or immediately after the Evets level as the mazes become very chaotic and fairly uninteresting to play afterwards. Eventually you find a tool or magic spell that will allow you to jump to various levels on command. From what I can recall Evets and his bodyguard are simple to defeat, but getting to them without "cheating" (jumping to the level automatically) is very difficult. There are many hidden rooms, even on Level 1. You do not collect objects directly from creatures or rooms, but you can purchase increasingly powerful ones at the shop (one on every level I believe) by collecting gold. Like the monsters, the objects and spells were also very numerous. The author also added a "Lost" status wherein your character was permanently deleted after death; nothing could bring it back. This would happen if you carelessly allowed your character to be hit by certain creatures' venom or spells, without the adequate life-support tool. Thanks, George. That's good information to know. I wondered why I couldn't find him, but I'm glad to know that there's no world-changing victory if you do. Addict, thanks to the Anonymous comment on this page I found Guild. It looks interesting, but the level limit is 5. I'll play it to see how it is. 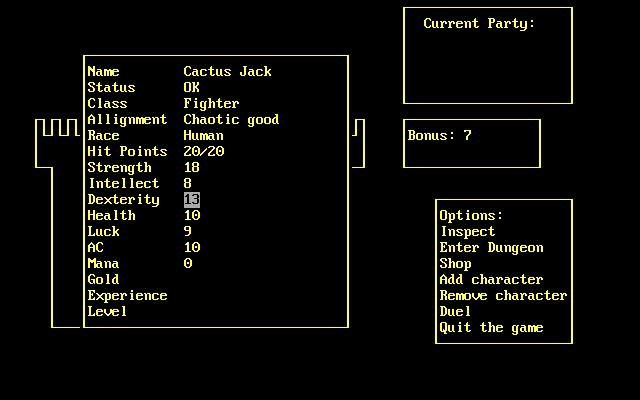 I have an idea for a multi-character roguelike, but my ambition far outstrips my ability. Right now it's in the VERY early planning stages. No, Mr. Ackerman did not have a partner named Nathan Utley. His good friend Bob Allsop helped with some of the coding, though. Well, you learn something new every day. I always figured Cactus Jack could only possibly refer to one thing (the wrestler), and here I find out he stole the name from a cocktail? Weak. Oh, actually, according to Wikipedia, he could have stolen it from many different sources, so never mind. Also this game is astoundingly poorly proofread. People have pointed out the same thing about my blog. You do have to give a little understanding (though I'm always the first to point out errors) to amateur enterprises without professional editors. Damn, and i tought my idea for a party based rogue like was original.